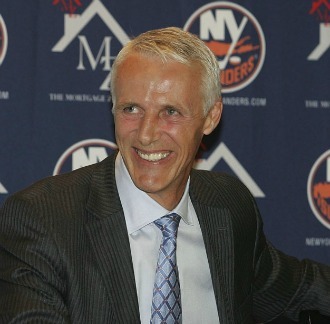 Drafted 15th overall in the 1977 NHL Entry Draft by the New York Islanders, Mike Bossy began a stellar 10 year career whereby he established himself as one of the most talented snipers the game has ever seen. ’The Boss’ amassed 573 goals and 553 assists for a total of 1,126 points in only 752 games, averaging nearly 1.5 points per game. As an integral part of the success of the New York Islanders dynasty that culminated in 4 consecutive Stanley Cups between 1980 to 1983, Bossy scored the Stanley Cup winning goals two years in a row making him the only player in NHL history to have done so. He was named as a first team All-Star five times and a second team All-Star three times in his career and won the MVP in the 1982 All-Star game. In international play, Bossy represented his Canada in the 1981 and 1984 Canada Cup tournaments. In 1984, he scored the winning goal in sudden death of the semi-final game that eliminated the Soviets and led Team Canada to their second championship. In 1991, Bossy was inducted into the Hockey Hall of Fame the first time he was up for induction. His number, 22, will never be worn by another New York Islander, as it was retired by the organization in the same year. A Hall-of-Famer, fluent in English and French, Bossy has many years experience in media, public relations, motivational speaking, marketing and business development in several industries including manufacturing, financial services and technology. Bossy is a respected, well known business spokesperson across North America. Bossy draws on sport and business experiences to stress the need for commitment, teamwork, and fair play to achieve superior success in both business and sports. Speaking from a personal record of high achievement, Bossy offers informed and entertaining presentations on what it takes today to create a winning competitive strategy. "Mike Bossy did a great job for our event. Not only did he keep our group laughing, but wove the theme of our meeting continually through his speech." "Smart. Funny. Totally in control at all times. Did a great job at grasping a really substantial role as MC for this event and related extremely well to the audience and the executive. He was a perfect fit for this program." "The speech was phenomenal – the absolute best speaker we have ever booked. Mike did a fantastic job of integrating our conference themes in an interesting way."